There are endless things we can do to save money. But many times we overlook the most obvious of ideas. For example, there are some great apps out there that help you save money without much effort. 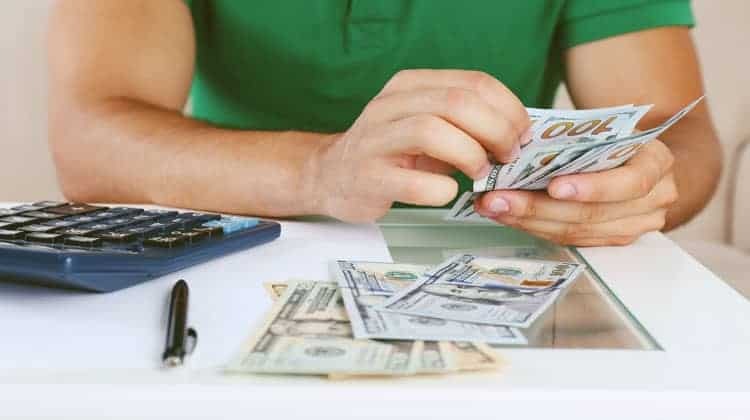 Because of all the ways to save money and the ease it is to miss some simple tricks, I decided to compile this ultimate list of 76 ways you can save money. By the end, you will have endless ideas and strategies you can start using to save as much money as you want! And at the end of this post, I’ll share with you the simple thing you should be doing with this money to help you grow it into larger sums of money with ease! So what are you waiting for, start checking out these 76 tips for saving a ton of money! Saving money around the house doesn’t have to be a chore. Here are a handful of simple things you can do to start saving money today! If you have a slow running drain, pour some baking soda into the drain and then add some vinegar. You will get a foamy reaction that will break down the clog. After 15 minutes, run some hot water down the drain for 5 minutes and the clog should be cleared. If you have a bad clog, you might need to repeat this process a couple of times to fully clear it out. If you have hard water or lime buildup on your faucets, don’t run to the store and pay a hefty price for some dangerous chemicals. Try the natural way first. Get a bowl and fill it with vinegar. Then place the faucet or shower head in the vinegar overnight. It will naturally break down the deposits. If you can’t remove the faucet or shower head, pour the vinegar into a Ziploc bag, put the bag over it, and use a rubber band or tape to secure it. The goal is to get as much of the faucet or shower head submerged into the vinegar. In the morning, you may need to get an old toothbrush and scrub a little but you will see that most of the buildup is gone. As with the previous tip, if you have a really bad case, you might need to let it sit for a little longer. When you dust, find an old shirt you don’t wear any longer and use it as a rag. Many people use paper towels and throw them out which wastes money. You can reuse the shirt a few times, then add it in with your laundry and use it all over again. The added benefit here is the shirt is a soft cotton fabric, so when you are dusting delicate items, you don’t need to worry about scratches. Not many people are aware of the fact that many of your electronics go into standby mode when you turn them off. This means they don’t turn off, rather they enter into “sleep” mode. While in sleep mode, they still require electricity. If you have a power strip with everything plugged into it, there should be a power button on it. Simply flip that button to off when you are done watching TV. When you want to watch it again, simply flip the switch back on. Note that if you have a cable box, you should not connect it to the power strip if you plan on using this tip. The cable box keeps time for many people and gets updates from the cable company. By keeping this plugged in separately, you ensure that you do not have to reset the time constantly and you allow the device to receive updates. Alternatively, you can get a smart power strip. This power strip allows you to configure your devices so that when one turns off, power is killed to everything else. They even have a separate plug for your cable box so that it always stays on. Here is my favorite smart power strip on Amazon. t will still come out clean. By using only cold water, you do not have to use the energy needed by your hot water tank to heat the water as often. The process of heating your water costs you money. The less you have to heat your water, the more money you will save! Of course for certain garments or tough stains, you should still use hot water. When you use your microwave to boil water as opposed to your stove, you’ll use 60% less energy and will boil water much faster, resulting in a lower electric bill. Just be sure to use gloves when taking the bowl out of the microwave! When you are cooking on your stove, be sure that the size of the pot or pan matches the size of the heating element. If you use a 6 inch pot on an 8 inch heating element, you’ll be wasting over 40% of the energy. Buy a barrel and connect it to your home’s storm gutters. You can then use the collected water to water the lawn or garden, wash your car, etc. Just make sure you keep a lid on it so that it doesn’t become a breeding ground for mosquitoes! If you have gas heat, to save money on the high cost of filling your tank every winter, buy a small portable electric heater. You can use it for a few hours every night to heat your house instead of relying on the furnace. The cost of the electric you will use will be much less than the cost of the gas. In the winter, you can turn on the fan on your thermostat to blow the warm air throughout your house. Obviously, when the heat is on, the fan is blowing the warm around. But you can keep the fan on after the heater turns off to continue circulating the air, thus keeping the warm air moving around your house. This will result in your house staying warmer longer, saving you money from having to heat the air as often. In both the summer and winter, there is no need to heat or cool your entire house when you only use certain rooms. To save money from heating and cooling them, simply close the vents in those rooms as well as the doors. If you live alone, you can take advantage of shopping at warehouse clubs to save money. Simply team up with a neighbor and split the costs and the food. Even if you aren’t single, you can still team up with neighbors to save money by buying in bulk. To save money on garbage, again team up with your neighbors. You can share the service and split the bill. I have a friend that does this, but instead of paying, he mows the small yard for his neighbor during the summer. If you have a stockpile of plastic grocery bags, you can use them to save some money. For example, when shipping things, you can use the plastic bags as filler to protect the contents of the package. You can also use them when scooping kitty litter or when you take your dog for a walk. If you have an old printer, VCR, or cell phone collecting dust, you can go online to trade them in. Many sites will send you cash or gift cards. Check out sites like Wire Fly Trade Ins. They will give you an estimate of the value of your item and you will send it in for free. After inspection, they will verify the price they will pay for the item. If you don’t want to go the online route, stores like Amazon and Best Buy also have trade in programs. At the very least, don’t toss it into the trash. Take it to Best Buy where they will recycle it for you at no cost. By trading in these things, you will free up space, which can have a big impact on saving you money in the long run. Simply switch the default font you use from Arial to Century Gothic. You won’t notice the difference, but your wallet will. Studies show that by switching to this font saves a person around $20 a year if you print 25 pages a week. In addition to this, check out ink recycling. Some stores offer a coupon when you bring in your used ink cartridges to recycle. Instead of buying everything new, look into high quality used items. There are many places you can find items for sale, including Craigslist and Facebook Marketplace. Alternatively you can check out sites like FreeCycle where you can get things completely for free. Many time the quality and details of most vintage items can’t be matched today. And with less cash in our pockets, vintage is at the forefront of the drive to live stylishly for less. There’s no need to head to pricey interior design shops to furnish your home, not unless it’s to pinch ideas. Auction houses are the best way to furnish a house when funds are tight, letting you pick up beautiful, solid pieces of furniture. Mirrors, wardrobes, paintings and desks are all excellent buys at auctions. You are paying for convenience here. Disposables are very convenient, but you pay a premium for that luxury. Instead of buying disposables, go out and buy items that will last you use after use. You spend a little more upfront, but you will save each and every month you don’t have to buy more disposable items. Did you know that lowering the temperature on your water heater by a few degrees can save you some serious cash? Most water heaters are set at 140 degrees. This temperature is really unnecessary. If you drop the temperature by 20 degrees, you will start seeing some savings. After all, it takes a lot of energy to heat up the entire water tank. And the best part is you won’t notice the difference of going from 140 to 120 degrees. Yes, a budget can help you to save some money. When you see where you money is going, you may be surprised. That $3 here and there really does add up. There are a lot of options out there when it comes to budgets. You can use a pen and paper, spreadsheets, even apps. The trick is finding the one that works best for you and your situation. Don’t get frustrated if you have to try a couple out until you find one that works best for you. Overall, the best budgeting app I’ve found is GoodBudget. The best spreadsheet budget is Tiller hands down. Groceries and food in general are a big part of every household’s budget. Here are some easy things you can do to save money on food costs. Buying meat at the grocery store is expensive. Once a week, try going meatless for a day. Have a salad for lunch and maybe make some soup for dinner. You’d be surprised as how much money you save over time by doing this trick. If you really want to be adventurous, try going meatless a couple times a week. Not all grocery stores are the same and not one is the best for everything. Take a little time to figure out which ones have the best prices on which items and tailor your shopping accordingly. Also be sure to pay attention to sales. If you plan your meals around the weekly sales, you can save even more money at the grocery store. There has been debate about expiration dates on food at the grocery store. A majority of food will last well beyond the printed date. If you are comfortable with pushing expiration dates, then you can go into your grocery store and ask them for “day olds”. This is exactly as it sounds. You can save around 40 – 60% on these items and they are still good to eat. Most stores have policies about their expiring foods and day olds. They would rather sell them than have to give them away or toss them. I’ve saved a boatload buying chicken whose sell by date is that day or the next day. Usually it will be with the other chicken, but will have a special $1 off coupon. I only do this when I plan on making chicken that day, to ensure it is safe to eat. It has been said time and time again that brewing your own coffee will save you a lot of money. Instead of just brewing your own coffee, what about roasting it as well? There are quite a few websites and stores where you can buy unroasted, green coffee beans. The best part is that you can roast them yourself with just a popcorn popper. After you roast your beans, then you can just grind them and enjoy. If you don’t want to roast your own coffee, then you can still save by buying whole bean coffee and grinding them. It tastes better than already ground coffee beans. This is a simple tip that can really save you money on your food costs. When you are hungry, you tend to overspend. If you find yourself hungry often and stopping to get fast food or picking up food at the grocery store, then keep food in your car. Something like a granola bar or trail mix can be really good to satisfy your hunger and will help to keep you feeling fuller for a longer time. When you can snack in your car, you don’t have to stop to get fast food, thus saving you money. Loads of people are put off by a little scratch on their furniture. But purchasing items with minor imperfections can save you a ton of money. Last summer I saved hundreds on a new freezer because it had a tiny scratch on the side, and I mean tiny. Before that I saved $400 on a TV that had a scratch on it. At least that was the reason given. Both myself and two store associates looked over the TV for close to an hour and no one found a scratch. Whenever you go shopping, just ask where they have the scratch and dent or open box items to save money. Compared to food, health and beauty spending seems unbearable. And every year it seems healthcare related costs only go up. Here are some ideas to help you slash your spending on health and beauty products and services. Simply go to a dental school, where students perform the work while supervised by a dentist. You can go to the ADA website and click on Dental Schools to find one in your area. I’ve known a couple people who did this and they never complained about the service they got or later on. The work was always done right. Many mouthwash products on the market contain alcohol. Not only does this dry out your mouth, leading to bad breath (the mouthwash simply covers up the smell temporarily), there are studies linking alcohol to oral cancer. To save money and be healthier, buy a container of salt and simply add it to some warm water and use that as your mouthwash. Whenever you go out for the day shopping or running errands, take a bottle of water with you. It is free, which means you will save the $1-2 it would cost you to buy a bottle. Plus it keeps you hydrated, which will keep you feeling full, saving you money by not eating out. I personally use this Camelback water bottle. It is insulated so my water stays colder longer on hot days. Do you have prescription glasses or contacts? Don’t buy them from your eye doctor. You can get your prescription from your eye doctor and then buy online. Stores like Zenni Optical and Vision Direct provide you with an easy way to buy glasses and contacts. You can save over 50%. I’ve been wearing glasses since kindergarten. I used to buy my lenses and frames at the eye doctor. But now I buy my frames online. The prices are much more competitive. Sometimes I will take the frames to my eye doctor and buy the lenses there if they are running a special. Otherwise I get my lenses online too. It’s simple to fill out the form and get your prescription right. If you pay out of pocket for health related expenses, such as x-rays, shop around. In most cases an x-ray at a hospital costs 20-50% more than if you go to an outpatient center. Most people do not realize this. When your doctor requires you to get testing done, simply call the local hospital and the local outpatient centers and ask what they charge. Then go with the one that offers the lower price. If you have access to a flexible spending account or health savings account at work, you need to take advantage of these. You put money in pre-tax and then you pay for qualified medical expenses with this money. The entire process avoids tax. And this can save you a lot of money. If you are in the 25% tax bracket, every dollar you put into these accounts saves you $0.25. It doesn’t sound like much but it adds up! This category covers a lot of areas, but the one thing they all have in common is shopping. Everyday purchases quickly add up, so it makes sense that if you can find ways to save money here, you will be able to save a good chunk of money. When a new phone model comes out, you may be tempted to run out and buy it. This is not a wise move. First off, if you are in the middle of a contract, many times you will not be able to get the phone at the lower advertised price. You will have to pay the full price. And this price can be shocking. For a new model that costs $199 with a new two year contract, you will pay the full price of $899 for the phone! If you simply wait until your contract is up, then renew, you can get the phone for the lower price. In addition, if it is a brand new model, it might have some glitches. There is an old saying that says when a new model comes out, wait until the next generation comes out to buy the current version. For as much testing the company does on the phone, it never is the same in the real world. Wait for the next version and avoid all the headaches. Also by waiting, the model you had your eyes on will be discounted because there is a newer version. Lastly, if your phone is acting up, don’t assume you need to buy a new phone. This also includes a broken screen. Chances are you can get it fixed for a lot less than paying for a brand new phone. Instead of sticking with the big boys (Verizon, AT&T, etc.) and their large monthly bills for service, switch over to a discount provider. These days the smaller carriers have networks that rival the big players but don’t come with the hefty price. hey use AT&T cell towers so the coverage I get with them is exactly the same that I was getting when I was with AT&T. The catch: I am paying just $35 a month for service. This includes unlimited calls and texts and 2.5 GB of data. If you switch, you can earn a $25 account credit. One final trick when it comes to cell phones. Most carriers are doing away with discounted phones when you sign up for a 2 year agreement. Instead of paying $200 for a new iPhone, you are paying $25 a month. Over 2 years this comes to $600 which is the price of a new phone without the discount. You can easily get around this by purchasing your phone online. I’ve bought my new iPhone on ebay and bought my mother’s phone there as well. There is a risk to buying this way and I am a version behind, but the savings are substantial. Just make sure you ask questions and check out the return policy before placing a bid. If you want a safer route and one I am going to use going forward is Decluttr. Here you can get a used phone for the best price. Even better, they verify the phone is in working condition and offer help if there is an issue when you get your phone. When shopping online, you should make it a habit to search for coupon codes. There are a handful of sites that offer online coupon codes to enter at checkout to save yourself some money. To find them, do a quick search using the retailers name and the term “coupon” or “promo code” to try to find a discount. When I do this, I tend to get a coupon that saves me money 80% of the time. Are you doing a project around the house and need a tool? Instead of going to the hardware store to buy an item you will rarely use again, consider renting it for the weekend. There are many rental shops up all over the place. The savings for going this route could be substantial. In the event you find there is no place to rent the tool you need, consider asking your neighbors. You never know if they will have what you need or maybe could offer an alternative too. Buying in bulk can save you incredible amounts of money. Granted many of these clubs require an annual membership fee, however if you shop there regularly, it is well worth it. Just keep an eye on prices. While there are plenty of great deals, sometimes the prices are not cheaper as compared to the grocery store. Next time you go to the grocery store, make sure you take note of the prices for the items you buy. Then when you go to the warehouse club, you can compare deals. As an added note, when comparing prices, do not look at the total price, but rather the unit price. This unit price is the true price for the item, multiplied by the size of the item. While not everything at the dollar store is worth buying, you can get many things for a fraction of what grocery and drug stores charge. For example, you can buy greeting cards for $1 or less. You can buy gift wrapping and other decorations for cheap too. We regularly buy crayons and coloring books for our daughters there. Take a trip and check out the things they have and see how much you could save. Just be sure to take into account the quality of the items as well. If you are smart with your shopping, you can save tons of money by buying late. The obvious example here is with holiday decorations. After the holiday, stores drastically reduce prices. You can stock up for next year at half the cost. You can do the same thing with clothes. Just buy at the end of the season. Since stores tend to have these clearance sales before the season actually ends, you can get some wear out of you new clothes this year. You can even do the same thing with cars. Wait until the model year is up and then consider buying for a nice discount. Not only is using canvas bags for groceries a wise move for the environment, but it also saves you money. Many stores, even national chain stores have begun to offer you discounts if you use reusable bags for your groceries and other items. In most cases, you will save $0.05 per bag. Assume you use 5 bags per week grocery shopping. That comes to $0.25 per week or $13.00 a year. Now you are telling me, that is not worth it for so little money. Well if you invest that $13.00 at 5% and add the $13.00 you save each year, in 25 years you have just over $700. Again, not a million, but that is just with $13!! Start adding all the other money you save from these tips into the mix and watch how fast your money grows. Home centers will set aside the torn bags of mulch and then sell these bags at a discount. To have the best chance of getting these bags is at the end of Saturday or Sunday. Simply bring some duct tape to seal the bag and a tarp to keep your car clean. You should always be looking at different ways to try to save some money. For example, instead of buying the expensive rock salt to melt ice in your driveway, have you considered using water softener salt? It does the same thing and costs much less. Or have you thought about creating your own seasoning mixes instead of paying for the pre-mixed packages at the grocery store? Or maybe your local township offers free mulch. All you have to do is transport it home. When you stop and think a little, you can come up with many alternative ways to save a few dollars here and there. You can find gift cards for close to 30% off their face value (so you would pay $35 for a $50 card) at sites like GiftCardGranny. There you can buy gift cards at a discount or sell unwanted gift cards for cash. You can also get gift cards for a discount on ebay and craigslist, but they aren’t as safe as GiftCardGranny. If you are on Facebook, make it a point to “like” the products and companies you use most often. Many companies have begun to send coupons to those people that “like” them on the site. It’s a free and easy way to get coupons to save money. The trend of renting dresses, shoes, bags and jewelry that you can’t afford to buy has taken off over the last couple of years. Costs vary depending on the popularity of the item with a Louis Vuitton Judy GM handbag, valued at $2,000 for example, typically costing $60 for a seven-day rental. Items can usually be hired by the evening, the week or the month and prices get proportionally lower the longer you hire. For those super-special occasions, designer rental is an option worth knowing about, but don’t get carried away. It’s as far from investment shopping as you can get and normally you’ll need to give your credit card details for the full value of the item, just in case it gets stolen or spoilt in your care. If you’re shopping for clothes or just about anything else online, do your wallet a big favor and download the InvisibleHand add-on to your computer. After loading it onto your machine, InvisibleHand sits quietly in the background until it recognizes you’re shopping online, at which point it jumps in and tells you where to get the same thing cheaper. Unlike price comparison sites which gather prices from retailers at specified intervals, InvisibleHand is always live, gathering prices there and then. From there, you can see if the online retailer is on Ebates so you can enjoy an additional discount through cash back. Don’t reserve haggling for holiday markets. Department stores and larger shops are well-used to people trying to knock them down on expensive items. It’s not uncommon to get as much as 20% off just by asking. Don’t think about paying full price for a new sofa without at least trying to snag some money off. At the very least you should be able to get the delivery charge waived or some free cushions for the sofa. And always remember to ask about interest-free credit too, meaning that you don’t pay a penny more than the original cost of the items, but can spread it out over three or four years. Many shops do it, especially for bigger purchases, but don’t always advertise. Ever notice how easy it is to overspend when you are having fun? I’m not sure if we just ignore the costs of things when having fun or we give in to peer pressure. Regardless of the reason, there are ways to save money on entertainment. Here are my favorites. Sites such as Cash 4 Books and Sell Back Your Book will buy your old novels. Simply type in the ISBN and see what they will give you for it. If you agree to sell it, you print out a prepaid mailing label, box up the books, and ship them out. You can choose either a check or credit to your PayPal account for payment. To avoid having to sell old books like in the above example, you can just rent a book instead of buying it. Check out your local library or even see if they have an agreement with Amazon. More and more libraries have deals with Amazon to allow you to borrow a book digitally and read it on your tablet. And many libraries allow you to rent movies and other items too. Before you buy something, check your local library first! If you shop on Amazon, you know that many times the Kindle version of a book is cheaper than the physical copy. But you can save even more money on that digital version. Next time you are buying something on Amazon, look at the shipping options. Many times they offer a basic shipping option. In return for choosing this option, they give you a digital credit of $1. You can use this credit to buy a digital book or music. If you can wait to get the item choosing this option to get $1 makes sense. Just note that this credit usually expires in about a month, so you will want to use it quickly. And for those of you who don’t have a Kindle, don’t worry. You can download the free Kindle app on all of your devices. I read Kindle books all of the time on my iPad. The cost of going out for the night with friends can easily surpass $100. Go out once a week and you are looking at $400 or more! Instead of going out, invite your friends over for a night in. Play video games or board games, or even watch a movie. My friends and I do this twice a month. One week we will go over to their house, they will make us dinner and we’ll play board games all night. The next time, they come to my place, I make dinner and we play video games. We have a great time and save money! You can save money on your debt. And since debt carries such a high interest rate, making it a point to focus on this spending can save you a ton of money. When you have a loan on your car, your insurance company, like Liberty Mutual, will require that you have full insurance coverage for your car. The quicker you pay off the loan not only saves you on interest charges, but will allow you to reduce your auto coverage, saving you money. Of course, reducing coverage assumes you have a healthy emergency fund to cover you if the unexpected happens. What is the interest rate on your debt? If we are talking credit cards, odds are it is close to 20%. If you make it a point to pay off this debt, you are saving a lot of money on interest charges. And not only this, once you pay off your debt, you can take the money you were paying each month and put it into a savings account. Not only will your savings grow from your deposits, but you will also be earning interest on your money too. If you get paid on a bi-weekly basis or every two weeks, then why not pay your mortgage this way? Many banks will allow you to switch to paying every two weeks and when you do, you can save money on interest along with shrinking your mortgage faster. When you switch to bi-weekly, you are adding one more full payment per year. If your bank doesn’t have this option, you can still pay bi-weekly. Just take your monthly payment and divide by 2. Then transfer the bi-weekly amount into a savings account when you get paid and then make a full payment by the due date. The reason you wait to make a full payment is because most banks will not credit you if you make a partial payment. They will just sit on the money and earn interest while waiting for the rest of your payment. Cars and car maintenance is expensive. Luckily there are some simple things you can do to save money on auto related costs. When you are driving on the highway and get to your desired speed, set your cruise control on. You will save gas by limiting your acceleration and deceleration of speed. You will in turn get higher miles per gallon, saving money. Local independent shops charge less than the dealers to for working on your car. Most dealers may charge $70 per hour for labor or more. A good independent shop might charge $40 per hour. That is a $30 savings per hour! In addition, your local shops may save you some money by using parts that are used instead of new. For example, say you were in an accident and need a new tail light. Instead of spending over $100 for a new one, the independent shop may be able to get a used one for half that cost. Check online for local shops as well as the yellow pages. Some may even specialize in your make of car. The website Repair Pal will offer you a free quote on what it should cost to fix your car. The site uses surveys it collects from thousands of shops around the country. By using this site, you will have a better idea if you are getting ripped off when you go to the repair shop and they quote you the cost for repairs. If you’re a two car household and only use the second car occasionally, signing up to a car club could work out far cheaper. These offer pay-as-you-go driving, allowing you to rent a car for as little as an hour. Prices typically start from $5 an hour or around $50 for 24 hours, and cars are generally available 24/7. Search ‘car clubs’ together with the name of your nearest town. On the surface you might think this option is more expensive than owning, but when you take into account insurance and maintenance of your car, you will see the numbers make sense for renting. Another option is to see if you can simply live with just one car. There will be times when you have to plan ahead, but chances are you pull this off if one person doesn’t drive much. When you pay your insurance premiums, be it auto or life, make sure you sign up to pay the premiums on an annual basis. In most cases, the insurance carrier will charge you a fee for the “convenience” to pay monthly. They make also give you a discount when you pay in full. Simply create a budget so that you can transfer money every month to a savings account so you have the money to pay on an annual basis and save yourself from the fee. There are other ways to save money that don’t nicely fit into a category. As a result, I lumped them together in this miscellaneous category. Hotel are expensive. One easy and fun way to save money is to go camping instead. There are many places where you can camp for $5 to $15 a night. That is far cry from what a hotel costs. In many cases you don’t even need a tent to camp out. You could rent a cabin for less than a hotel room. Or if you really wanted to rough it, you could just sleep in your car or SUV. Many retailers and restaurants offer discounts and free food on your birthday. In most cases you do have to sign up for their free club which means getting emails, but this is a small price to pay in order to get some free food or discounts at places where you frequent! When you save money in your 401k plan, the money is taken pre-tax. This means there is less money for the government to tax, which means you take home more money than you otherwise would. For example, let’s say you earn $40,000 a year, are paid biweekly, and are in the 25% tax bracket. If you contribute nothing to your 401k plan, you pay roughly $385 in taxes each paycheck and take home about $1,150. But if you contribute 10% to your 401k plan, you pay less than $350 in taxes each paycheck and take home a little more than $1,025. When you look at how much you bring home plus what you saved in your 401k, it comes to $1,190 or $40 more than had you not saved anything. If you want to save more money, make it so that you save without any effort on your part. Well, aside from an initial 5 minutes, there is nothing else to be done. You can do this manually by logging into your bank account and setting up a recurring transfer to your savings account. Another option is to see if your employer will do it for you. All you do is fill out a form with how much you want to save and your bank information. When you get paid, your employer will deposit the amount you noted in your savings account and the rest of your paycheck in your checking account. Before making any purchase, think about it. Wait a few days to see if you still want the item or not. Many times you won’t. You will see that the advertisement you saw had you emotionally buy in to wanting the item, but when you allowed yourself some time to think about it, you realized you didn’t really need the item. This trick is by far the most important one and if you only choose to do one, this would be the one to focus on. Buying cards for special occasions cost a lot of money. The average card today costs around $3. If you have a family of 4, and not counting relatives, you are buying 9 cards a year for birthdays and holidays. That’s $27 just for your family, and does not include any relatives. In a year, the cost of cards can easily surpass $75. Save some money and go online and send them eCards instead. They are completely free and are available for any occasion. Plus, they get delivered to the recipients email instantly! If you don’t want to deal with eCards as noted above, I have another option for you. Well, two really. First, get your cards at a dollar store. In my area, I get 3 cards for $1. Yeah, that $0.33 per card. While the selection is smaller, the savings are substantial. Alternatively, you can make your own cards. Just get a piece of paper, fold it in half and grab some markers. It doesn’t have to be perfect. Remember it is the thought that counts! If you’ve got an opinion on everything, why not get paid for giving it? Companies across the country want to hear what the public thinks of their products and they’re willing to pay. While doing online surveys is never going to make you rich, it could be a fun thing to while watching TV. Typically you’re paid around $3 per completed survey. And here is a trick to earn the most money. Sign up for a couple survey companies. They all offer different surveys, so when you sign up for multiple ones, you will have access to more surveys. House swapping has really taken off since the recession and there are now plenty of websites where you can meet people who are happy to hand over their home for a week in return for you doing the same. With house swapping you can go pretty much anywhere in the world, staying in the kind of places you’d normally only dream off. From villas in Florida with an outdoor Jacuzzi and pool, to city pads in Berlin, all it costs is a small fee to the house swap agency, then your plane fares and some thank-you gifts for your hosts. If you can’t live another day with your tired old kitchen but are too cheap to replace it, check out websites dedicated to selling ex-display and used kitchens on behalf of showrooms and private clients. This can be a great way of getting well-built kitchens at a fraction of the original retail price or for selling your old one if it’s still got life left in it. Thanks to technology, you can save money using apps. There are a lot of options out there and some are not worth your time or energy. But I have found a handful that I use and save a good amount of money using. Because of this, I am confident you too will be able to save money using these apps too. If you do a fair amount of shopping online, you can easily save money. My favorite way to do this is through Ebates. When I shop through their portal, I earn anywhere from 1% – 25% cash back on my purchases. Every few months, they send me my cash via PayPal. It is so easy, you are crazy not to be using them. Signing up for Ebates is free and when you do, you get a free $10 gift card! In addition to Ebates, I also use Swagbucks. They too offer cash back when you shop through their portal. The reason I use two sites is because sometimes one will offer bonus cash back, allowing me to save even more money. As with Ebates, signing up with Swagbucks is free and you get $5 when you join through this link. Ibotta is an app that allows you to earn cash back when you shop are grocery stores and other retailers. Before you go out shopping, open the app and see if there are any offers that you need. Then click to redeem them and do your shopping. When you get back home, scan your receipt using the Ibotta app and collect your money. When you have $20 worth of earnings, you can request a PayPal payment. In the few months I’ve been using the app, I’ve already earned over $125 in cash back. New users get a $10 bonus when you redeem $10 in offers. This means you earn $20 fast. You can click here to get started for free. Receipt Hog is another way to earn money when you shop. Just scan your receipt and you earn coins. When you collect enough coins, you can redeem them for cash, a Visa gift card, or and Amazon gift card. The app offers bonuses all the time to help you increase the amount of coins you earn to help you reach your cash back goal faster. You can sign up for Receipt Hog here. This app is one I just started using and really enjoy. You can earn points by walking into certain stores, by scanning products in store, linking your credit card, or buying certain products. Once you earn enough points, you can redeem them for gift cards to your favorite retailer. On my recent trip to WalMart, I earned 15 points for walking into the store. Then I spent 10 minutes walking around the store and scanning the bar codes of products in the app. Doing this earned me close to 300 points and I’ve earned close to 2,000 points in a few short weeks. New users get 250 points when you join using this link. Qapital has you save money by rounding up your purchases. When you link your bank and credit card, Qapital will round up your spending and transfer the money from your checking account to a savings account. At any time you can transfer the money back and use it how you choose. For example, say you buy something for $12.40. Qapital will round this up to $13 and transfer $0.60 to your savings account. You can sign up for Qapital here. As great as it is to save money, if you don’t do anything with this money, are you really saving anything? For example, if you save $100 using these tips but leave that money in your checking account, odds are you are going to spend it on something. To truly save money, you need to transfer it to a savings account. There you won’t be tempted to spend it and you will earn interest, allowing your money to grow faster. For example, let’s say you are able to save $100 a month using these tips. Over 10 years earning 5% you have a pile of money that totals more than $15,000! Where can you get 5% on your money? Buy Worthy Bonds. Though they are called bonds, this is essentially a savings account. When you buy a bond, Worthy turns around and uses the money to fund loans for small businesses. This is the same thing that happens when you put your money into a bank account. The only difference is a bank account is FDIC insured. But your money is safe with Worthy as well. If you want to start earning 5%, click here. Of course, there is another option. You can invest your money. My favorite is Wealthsimple. When you invest with Wealthsimple, they will create a portfolio for you and take care of everything. You just have to spend 10 minutes answering a few questions and setting up a monthly transfer. And it gets even better. Remember in the last tip I talked about rounding up your purchases? Wealthsimple does this too. When you do this through Wealthsimple, your round ups are invested in your account, allowing you to grow your money faster. So there are 76 ways to save tons of money. Take your time and read through this list and pick out the ones that interest you the most and then start saving money. Once they become habits, run through the list again and pick a few more. Rinse and repeat and you will be saving a good chunk of money every single month. But be sure you actually save the money. Don’t just let it sit in your checking account or you will spend it. Put it into a savings account or invest it and let you money start working for you. Great advice! I stopped using paper towels when I realized I’m buying a new roll every week (that’s a lot of money per week). I converted my old T shirt to a rag. It has saved me a few bucks since then. I love the baking soda and vinegar trick. I’ll even boil a pot of hot water and use that too. I’m not ashamed to say I’ve used this method a handful of times. I should point out though, this method doesn’t work if you have a tree root growing into your pipes. That was fun. Saving money is effective way of keeping your earning without spending it. I loved what you post here. Keeping away from expensive restaurants can save us money. What i did was to bring bottle water whenever I go. It’s practically wise. I take my water bottle everywhere too. It really helps to save money from not buying drinks and even keeping you fuller longer. Thanks for the great tips. Personally, I feel that saving automatically is the most effective way to save money for me by far. What you don’t see you won’t spend.